Democrat Betsy Dirksen Londrigan and U.S. Rep. Rodney Davis at the GLT debate on Monday, Oct. 29, 2018, at the Normal Theater. Davis alleged much of the money Londrigan’s campaign raised in the last quarter came from out-of-state Democrats looking to impeach President Donald Trump. Monday's event was the sixth in a series of GLT candidate forums and debates leading to Election Day on Nov. 6. Davis said impeachment proceedings would keep Congress from passing legislation to move the country forward. Londrigan said she’s proud the majority of her campaign contributions came from individuals. Around 73 percent of the money Londrigan raised last quarter came from individual contributors, GLT reported earlier this month. While much of that money came from Illinoisans, she also received significant contributions from donors in California, New York, Massachusetts, and other states. “Over 75 percent of Congressman Davis’ money comes from PACs and special interests,” she said. That includes some of the large pharmaceutical companies currently facing lawsuits in connection with the nation’s opioid crisis, she said. “In terms of impeachment, that’s not why I’m going to Washington," Londrigan said. Londrigan did clarify she’ll wait for Special Counsel Robert Mueller’s investigation into Russian meddling in the 2016 presidential election to play out before weighing in. "Anything else is hypothetical,” she said. “That’s why I want to go to Washington, is to take your priorities and make them happen,” she added. Davis said that’s exactly what he’s been doing the last five and a half years on the job. While Londrigan receives money from “some of the most liberal donors that we have in this nation,” said Davis, his contributions come from local PACs with local interests. The candidates touched on campaign contributions again discussing how they’d work to reduce gun violence. Londrigan said unlike her opponent, her campaign does not accept contributions from the National Rifle Association. “They don’t really represent gun owners. They represent the gun lobby," she said. Londrigan said she supports banning bumpstocks, a device used to enable rapid fire in semiautomatic firearms, and requiring universal background checks for gun owners. Davis said he is an NRA member, just like tens of thousands of his constituents. "It’s insulting ... to minimize how they feel about being able to protect themselves and their families,” he said, again returning to Londrigan’s campaign donors. "I’d rather be beholden to the good, law-abiding gun owners in this district that I represent than Barbara Streisand and the Hollywood, San Francisco and New York City liberals that are going to ask for one thing: to impeach President Trump." Asked about his near lack of criticism for Trump following his election, Davis said he’s willing hold both Democrats and Republicans accountable when political debate turns ugly. He said it’s that rhetoric that incites violence, like when when a gunman opened fire on Davis and other members of the Republican congressional baseball team at a practice in Alexandria, Va.
Londrigan said the Trump administration has been repeatedly uncivil—actions that need called out. 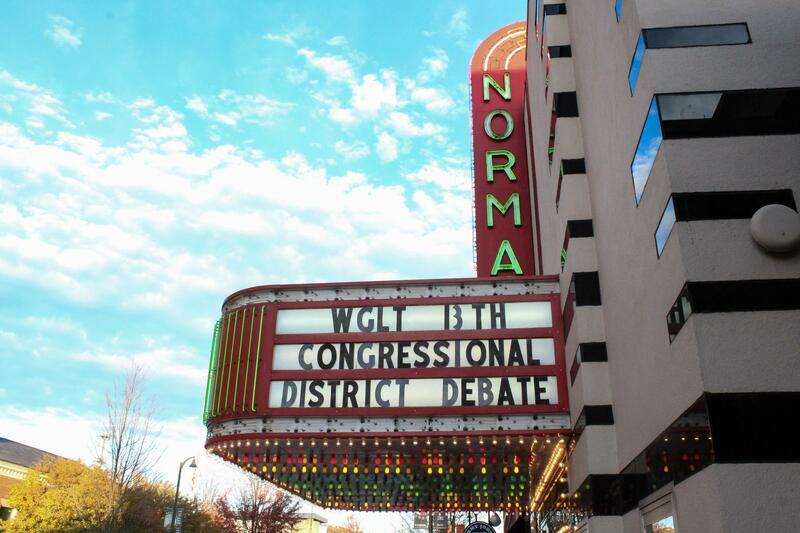 Monday's debate was co-sponsored by GLT, the League of Women Voters of McLean County, Illinois State University and its American Democracy Project, Illinois Wesleyan University, and Heartland Community College. Listen to the entire debate between Representative Rodney Davis and his challenger in the 13th district, Betsy Dirksen Londrigan.